Oil on canvas, 40 x 50 cm. I like the sadness in your paintings. this is my favorite. Same question: Is this work available? I am using this masterpiece as basis for my Philosophy assignment on Expressive vs Representational Art. 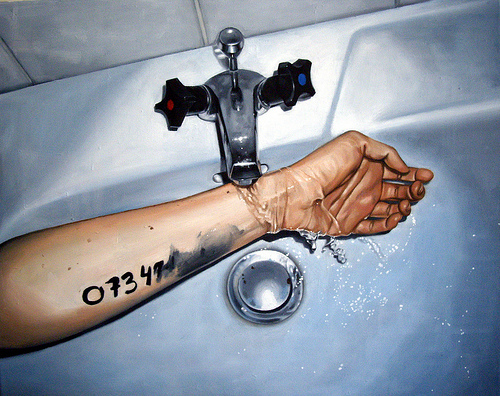 Linnea Strid, you are amazingly talented and I applaud you! I admire your work and am in awe. Wanted to let you know, we love the painting you did of our dog a couple years ago, it’s one of our most prized possessions and has a prominent place in our home. Keep making art, you have the power to emotionally touch people around the globe. And for this, I will be forever grateful for you and your​ artists brothers and sisters. your work is truly an inspiration to all. i love it so much that i have chosen you as my artist for GCSE and i cannot wait to begin re creating your work! could you send me some tips perhaps on my email? thank you so much linnea strid ! !